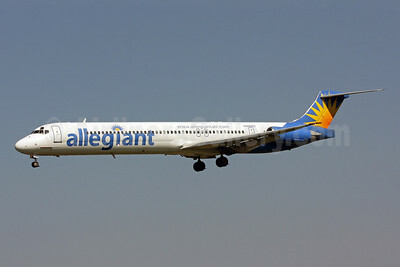 Allegiant Air (Las Vegas) today announced new, nonstop jet service on 18 routes, including 10 cities new to the Allegiant network. Today’s announcement will mark the 99th U.S. city served by Allegiant’s low-cost, nonstop service to popular vacation destinations, more than any other low-cost carrier in the U.S.
Allegiant will now offer service to travelers in the New York City area, providing a low-cost travel alternative to the beaches of Southwest Florida via Long Island MacArthur Airport and Stewart International Airport. Copyright Photo: Brian McDonough/AirlinersGallery.com. McDonnell Douglas DC-9-82 (MD-82) N406NV (msn 49900) completes its final approach into Baltimore/Washington. This entry was posted in Allegiant Air and tagged 49900, Allegiant, Allegiant Air, allegiant air las vegas, Baltimore/Washington, BWI, DC9, DC980, dc982, long island macarthur airport, McDonnell Douglas, mcdonnell douglas dc982, mcdonnell douglas md82, MD80, md82, N406NV, orlando sanford international, orlando sanford international airport on August 20, 2013 by Bruce Drum.